As anyone who owns a 3D printer knows, it may take some of trial and error to obtain good print results. This is especially the case for dual material prints. The Flashforge Dreamer supports dual material printing out of the box. However, I have noticed it can be hard to print parts without color mixing due to oozing extruders that wipe themselves clean on the edges of the part. 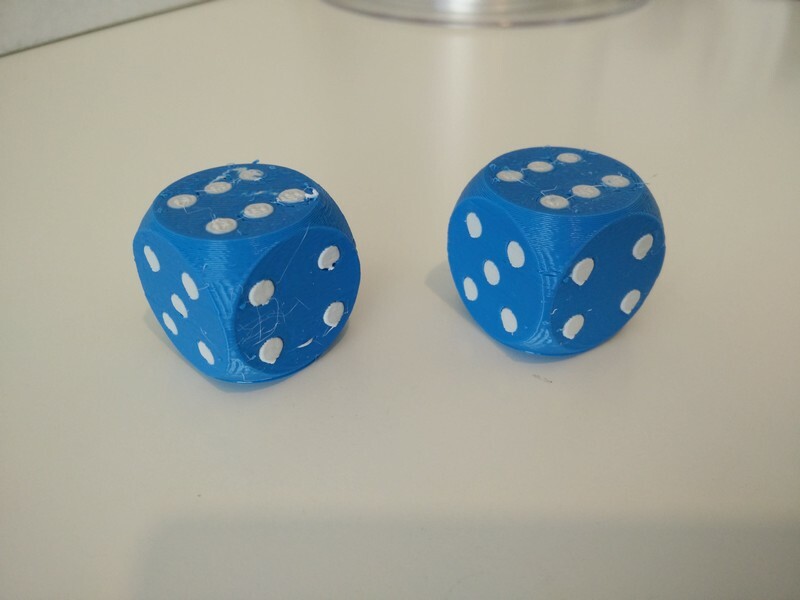 In this article I will describe a method to use dual extrusion with Slic3r, which significantly improves print quality. This part is used as an example, since the multiple small dots ar quite challenging to print correctly without color mixing. After several tries and browsing forums I found a solution in Slic3r that works significantly better than the standard approach offered by Flashprint. Update 22-05-2017: In Flashprint 3.17.0 a more advanced wall mode was introduced, better following the contour of the part. This might be a viable alternative if you prefer using flashprint. 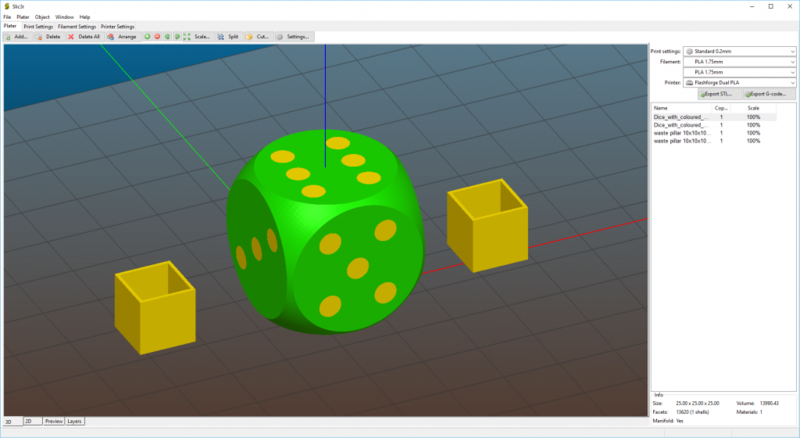 If you would like to experiment with Slic3r, please read on! When the initial setup is completed, the part can be prepared for printing. 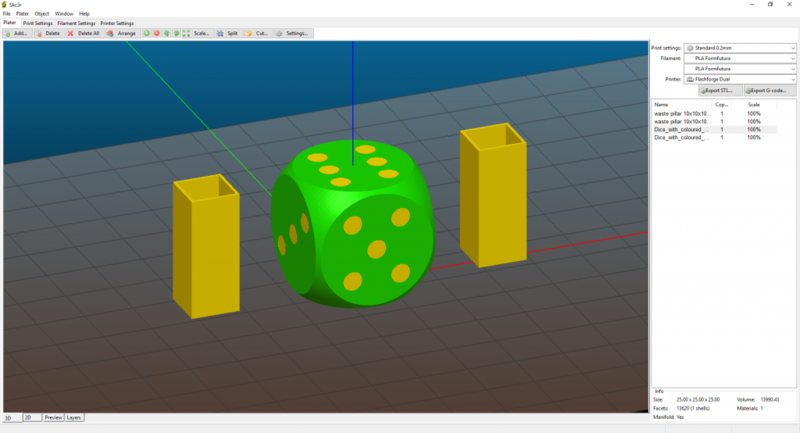 Load both STL files into Slic3r, in this case the body of the dice and the dot pattern. Load the prime pillar and duplicate it (or load twice). Place a pillar on the left side and a pillar on the right side of the part. 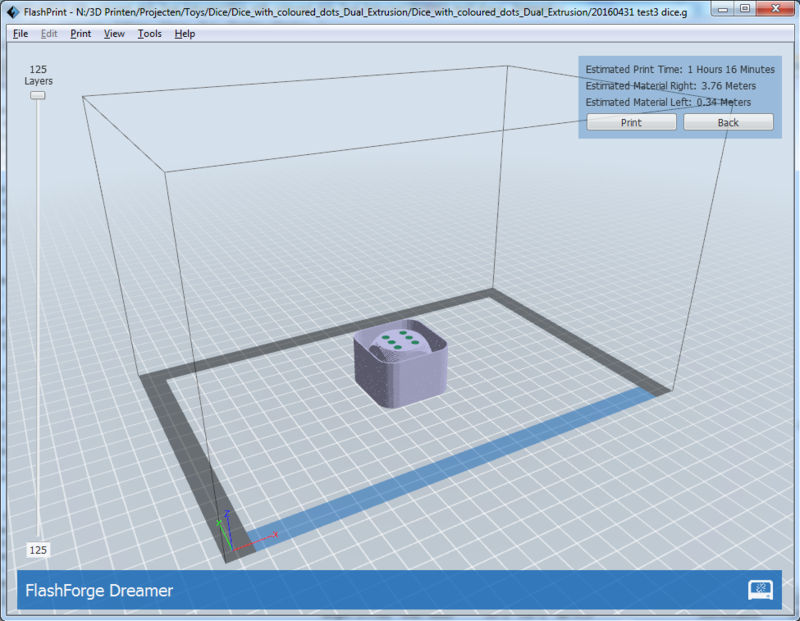 Double-click each part and select the extruder with which it should be printed. Print the left pillar with the left extruder (2) and the right pillar with the right extruder (1). In this example the body was printed with the left extruder and the dots with the right extruder. Place them at a distance larger than the distance between the 2 nozzles to avoid the left extruder oozing onto the edge of the part when the right exrtuder is printing the pillar and vice versa. In this example the distance is actually smaller, but since the unuzed nozzle is in the center of the part when one of the pillars is printed, this does not have an adverse effect. 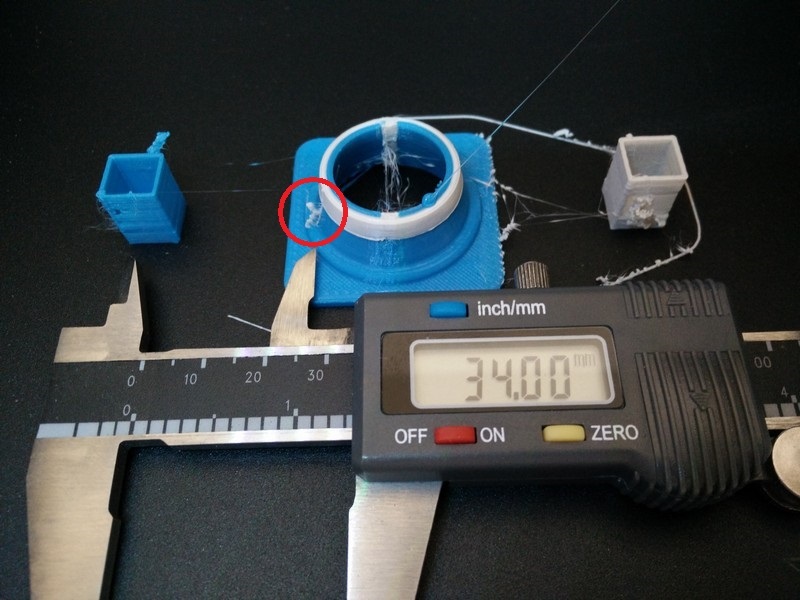 In te example below however, the distance was insufficient (<34 mm) and the filament oozing from the right extruder was deposited onto the edge of the model. Unfortunately, using prime pillars alone is not sufficient to prevent ozzing filament from being draged onto the part in some cases. There is a setting in Slic3r which is very useful in preventing this issue. 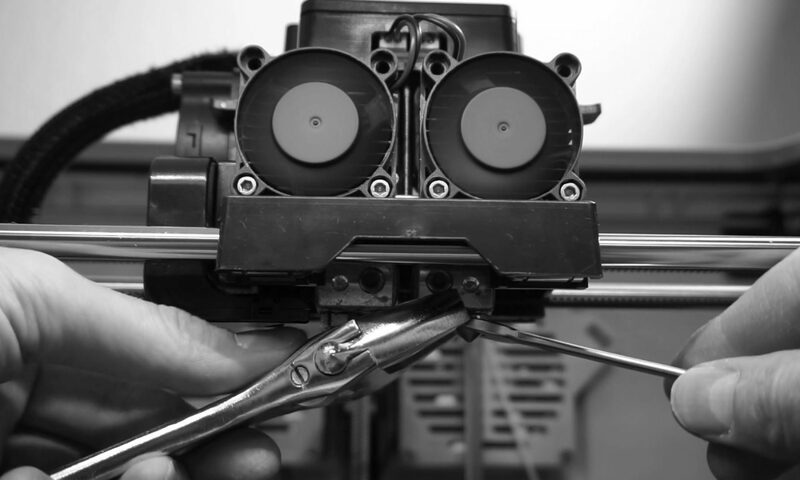 It lowers the bed between each retraction (therefore also at each tool change), so any blob hanging from the extruder does not come into contact with the outside of the part. 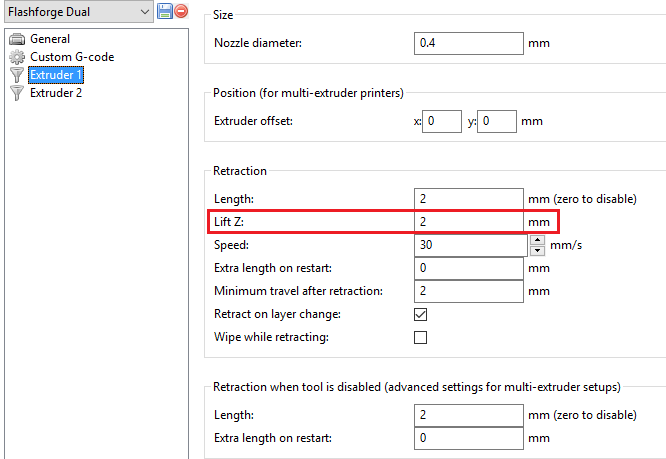 Enter a positive value in the “Lift Z” field under the Printer Settings tab. I found that for the filament I typically use 2 mm is sufficient, but the required distance may vary depending on filament, print temperature, etc. Set the same setting for each extruder. 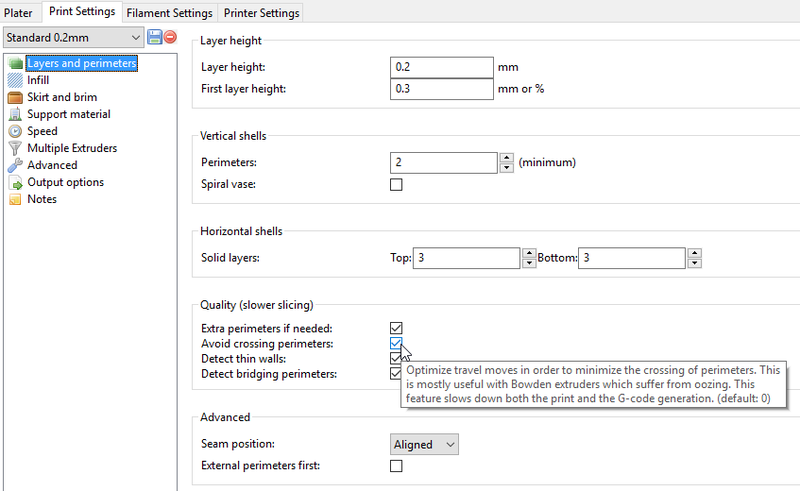 Slic3r offers a function in which it avoids crossing perimeters with an extruder if possible. In this example it helps specifically with the top layer. 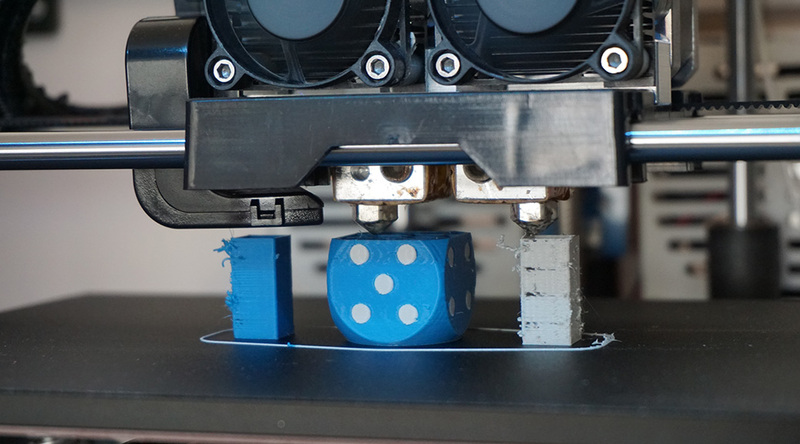 With this setting enabled, the extruder printing the body will not drag across the white dots of the dice and vice versa. In the picture below the final result is shown. Although not perfect, all the sides of the model are free from unwanted color mixing. In the pictures below the effect of the methods described in this article on the print quality is demonstrated. 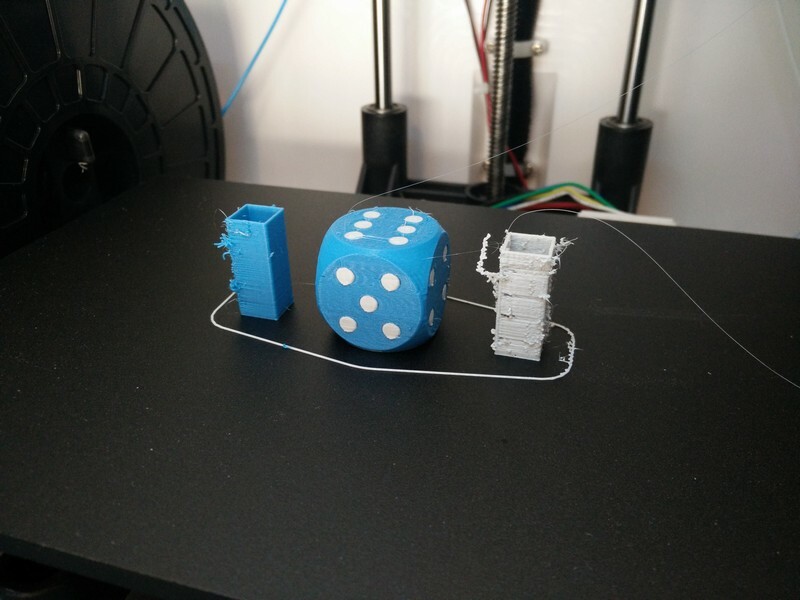 On te left a dice printed without pillars and Z lift. 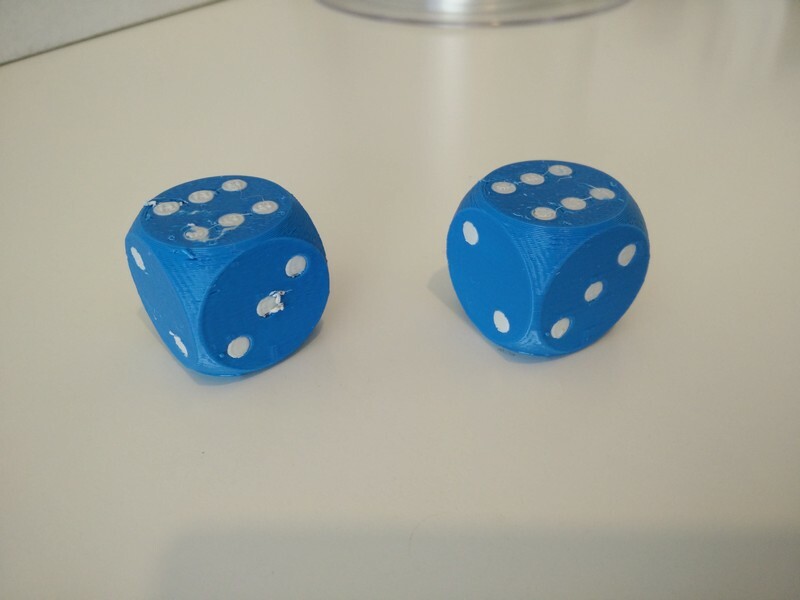 On the right a dice printed with the described print method. If you have any questions let me know in the comments. I printed it. My first dual extrusion print and it was surprisingly simple to do. Next I am going to try a QR code. I thank you very much for your article. I tried your method, but the printing does not always start with the prime pillar after a colour change. How you make sure that the printing starts with the prime pillar after an extruder (colour) change ? I have noticed this as well. The order seems to be random. Sometimes it prints in the order of the parts list and sometimes it does not. I agree that printing the prime pillars first would be beneficial for print quality, but at this time I have no solution to this issue. I hope the function to determine order yourself will be added again to the next version of slic3r.